The allure of the Northern Lights draws visitors and photographers from all over the world to see them. 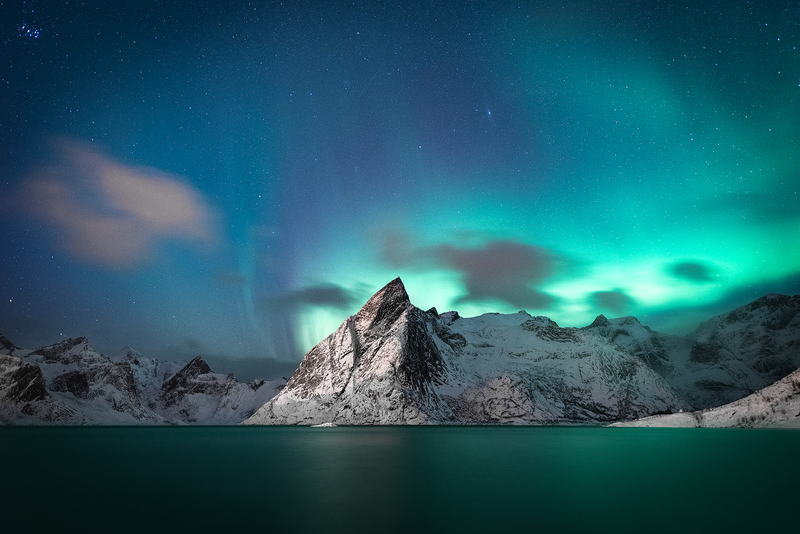 In places like Norway where they are frequently viewed, photographers embark on a mission to capture the Northern Lights floating over beautiful scenery. For many photographers, it can be a time and money consuming process to research and plan a trip to view them. The Northern Lights are there on nights with solar activity, but can only be seen if the weather allows it. With the proper planning and equipment, you can capture shots like this. You just have to be able to hike wherever is necessary and endure some cold weather! Photographer Tristan Todd captured this stunning image of an Arctic mountain being illuminated by the Northern Lights in Norway. The intense colors and movement in this photograph add to the magical look of the Northern Lights. In order to put this piece together, he combined seven back-to-back exposures for the mountains and water and one for the sky. His camera settings for the 6 second foreground exposures were ISO 2500 and f/2.8 with a 24mm focal length.